DANNY FINGEROTH is the editor or co-editor of information-packed books about how-to create comics and graphic novels, as well as co-producer of a DVD that shows you how it’s done. THE BEST OF WRITE NOW: How-To’s, Interviews, & Art from the Premier Publication About Comics Writing (edited by Danny) is a collection of sensational articles, interviews, and illustrated, practical demonstrations from comics’ top creators. Whether you’re looking to break into the world of comics writing, or missed key issues of Danny Fingeroth’s Write Now—the premier magazine about writing for comics and related fields—this is the book for you! Behind a foreword by STAN LEE, The Best of Write Now features highlights from the acclaimed magazine, including in-depth interviews about writing from top talents, including: BRIAN MICHAEL BENDIS, WILL EISNER, JEPH LOEB, STAN LEE, J. M. STRACZYNSKI, MARK WAID, GEOFF JOHNS, TODD McFARLANE, PAUL LEVITZ, AXEL ALONSO, and others! There’s also “NUTS & BOLTS” tutorials, featuring scripts from landmark comics and the pencil art that was drawn from them, including: CIVIL WAR #1 (MILLAR & MCNIVEN), BATMAN: HUSH #1 (LOEB & LEE), ULTIMATE SPIDER-MAN #47 (BENDIS & BAGLEY), AMAZING SPIDER-MAN #539 (STRACZYNSKI & GARNEY), SPAWN #52 (MCFARLANE & CAPULO), GREEN LANTERN: REBIRTH #1 (JOHNS & VAN SCRIVER), and more! How-to articles by the best comics writers and editors around, like JOHN OSTRANDER, DENNIS O’NEIL, KURT BUSIEK, STEVEN GRANT, and JOEY CAVALIERI. Professional secrets of top comics pros including NEIL GAIMAN, MARK WAID, TRINA ROBBINS, PETER DAVID, and STAN LEE! Top editors telling exactly what it takes to get hired by them! Praise for THE BEST OF WRITE NOW! Click to learn more about and to buy THE BEST OF WRITE NOW! HOW TO CREATE COMICS FROM SCRIPT TO PRINT is where you’ll learn from the pros! Write Now! Magazine editor (and Spider-Man scripter) Danny Fingeroth and Draw! 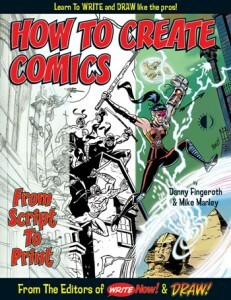 Magazine editor (and Batman artist) Mike Manley join forces for the ultimate “How-to” book on creating comics! Danny and Mike show, step-by-step, how to create a new comic from scratch; developing a new character, then going from script and roughs to pencils, inks, and colors—even lettering! There’s also a section that guides you through the process of getting your comic printed and distributed, and the finished 8-page full-color comic is included, so you can see the final product! This information-packed book contains important features, including: The script written in the two most popular formats (“Full-script”, in which art and script is described for each panel, and “Marvel style” where the artist works from a plot outline and the text is added later)! A critique of the character and comic from an editor’s point of view! Tips on coloring! Beginner and advanced writing lessons! Click to learn more about, and to buy, HOW TO CREATE COMICS FROM SCRIPT TO PRINT now! 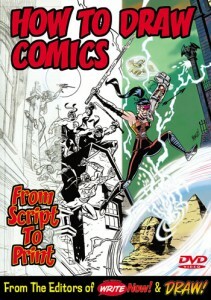 In the HOW TO DRAW COMICS FROM SCRIPT TO PRINT (DVD), let the pros show you how to create your own comic! Write Now Magazine Editor-in-Chief (and former Spider-Man Group Editor) Danny Fingeroth and Draw Magazine EIC, artist Mike Manley, have combined forces to create this one-of-a-kind instructional DVD! As respected comics pros, Mike and Danny have the years of hands-on experience at Marvel, DC, and other publishers to show you how a new character is created, from initial idea, to script, to drawn, colored and printed first story! Produced in conjunction with their Danny and Mike’s book, How to Create Comics from Script to Print, this step-by-step DVD documents the brainstorming process between the creative duo as they come up with new characters and concepts. Then, Danny discusses the scripting, and Mike walks you through how he produces layouts, penciling, inking, coloring, lettering, and more! Includes bonus features to augment the tutorials, showing the secrets the pros use in their daily work. This DVD can stand alone, but also complements Danny and Mike’s book, How to Create Comics from Script to Print! Click to learn more about, and to buy, the HOW TO DRAW COMICS FROM SCRIPT TO PRINT DVD now!